The museum was set up at 2002 by one room and gradually developed into three rooms of 400 square meters by 2010. In March 2012, the museum obtained the official license from the government. 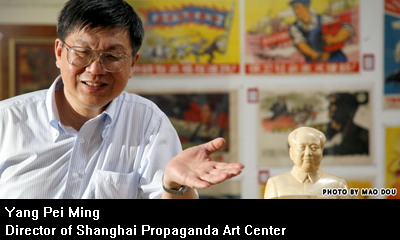 The official name in Chinese is Shanghai Yang Pei Ming Propaganda Poster Art Museum, but we still maintain the original English name as this name has been used for quite a few years in media and publication. Now the museum has a collection of over 6000 Chinese propaganda posters from 1940 to 1990, with an addition collection of hundreds of Shanghai Lady Calendar posters from 1910 to 1940.The museum is proud of this best and most collection in the world. The museum is interested in travel exhibitions as well as doing lectures and culture exchange with different institutions and schools around the world.